When you’re a manufacturing company as large as General Electric it can sometimes be incredibly difficult to adapt and modernize. It isn’t so much that large corporations aren’t interested in being flexible, avoiding waste and finding new ways to produce products, but like a large ship, changing direction isn’t always quick or easy. However, GE has just opened the first of what they expect to be many “Multi-Modal” facilities in Chakan, India that they believe will completely revolutionize how their products are manufactured. The focus of the facility is on flexibility, in both what they produce, how they produce it and what technologies they use. The next generation LEAP engine that uses a 3D printed fuel nozzle. It all started with a fuel nozzle, a component that is ubiquitous to any engine that runs on liquid fuels. The fuel nozzle is the engine part that sprays fuel into the engine, where it is burned and causes the entire device to run. Needless to say, a fuel nozzle needs to be durable, and the geometry of the nozzle itself needs to be exacting so the correct amount of fuel is released at the correct rate. And most importantly it needs to be able to really take a lot of heat, on average about 3000ºF worth of it. Because of its importance, and complexity, the fuel nozzle in a GE jet engine became the ideal component to be redesigned and manufactured using 3D printing technology. “Before GE targeted it for a reconfiguration, the nozzle was made up of 20 disparate parts procured from independent suppliers that were then painstakingly brazed and welded together. 3D printing completely transformed that process,” GE Aviation’s general manager for additive technologies Greg Morris told TechRepublic. The 3D printed fuel nozzle. 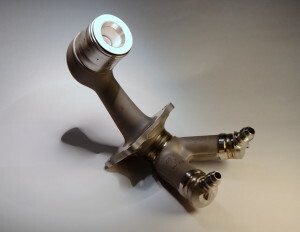 The result is a single part that completely replicates all of the twists, turns and interior chambers that the old fuel nozzle needed to have fabricated using multiple parts that would need to be welded and assembled. Instead, the new fuel nozzle was manufactured using a direct metal laser melting 3D printing process that turns thin layers of metal powders into fully-solid metal parts. Not only is it a single part, but it is 25% lighter and a remarkable five times stronger than its traditionally manufactured predecessor. As part of GE’s next generation LEAP engine, the fuel nozzle ended up saving about $3 million per aircraft, per year for any airline flying a plane equipped with one. Currently GE has taken orders for more than 8,000 of their LEAP engines, each equipped with nineteen of their new 3D printed fuel nozzles totalling about $80 billion in sales. The LEAP engines are expected to be installed in next-generation aircraft like the Airbus A320neo, the Boeing 737 MAX, and the Boeing 777X. While most of GE’s manufacturing facilities have metal 3D printing capabilities — they have for years — none of them could possibly manage that many parts on that scale, which is where the facility in Chakan, India comes into play. 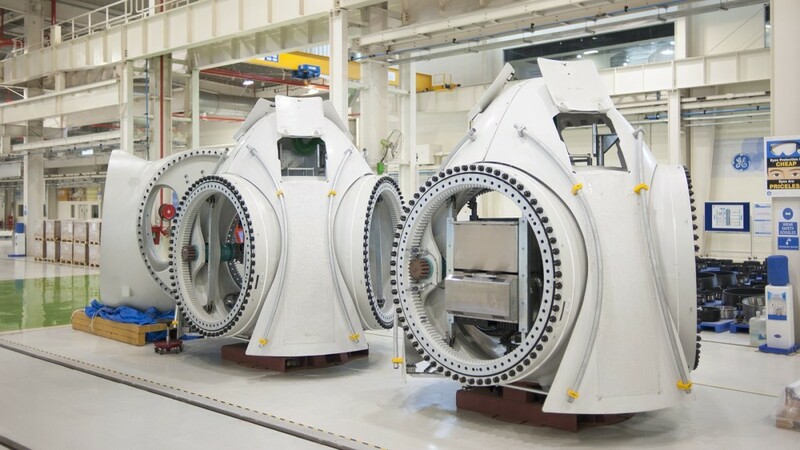 Wind turbine housings fabricated at the GE plant in Chakan, India. The $200 million “Multi-Modal” facility in Chakan was designed to be capable of manufacturing a wide range of GE products throughout all of the massive company’s divisions. It can assemble industrial equipment from the oil and gas division to aerospace, transportation and to power distribution, all in the same facility using the same workers. Because the factory can do anything that is needed, they can pick up the slack when more dedicated facilities are overwhelmed, and because the workers will be trained to work across the entire GE product line, they will be highly skilled, work faster and with fewer errors. Not only could this save GE billions of dollars, but it will make them more flexible as a company, and able to adapt to changes in markets much quicker. 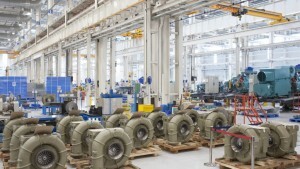 Locomotive turbochargers manufactured at the GE plant in Chakan, India. One of the key technologies that will be powering this new factory will be additive manufacturing. The one-year-old facility is expected to help GE reach their goal of manufacturing an anticipated 100,000 of their next-generation fuel nozzles by 2020, and eventually allow GE to produce more than 44,000 of them a year. The Chakan factory, which is expected to be a blueprint for the factory of the future, acts as a catch all manufacturing outlet for whatever needs GE has, and it will allow them to open a smaller number of dedicated facilities that can quickly become outdated or under-utilized. While their investment in such a facility is a clear indicator that 3D printing is expected to play a huge role in the future of manufacturing, crucially it offers the GE factory the ability to play a wide-range of roles within the company. The facility can manufacture replacements parts for any of their rare or one-of-a-kind machines, parts that can often take weeks or months to recreate, in a matter of days. It also offers GE the ability to produce large-scale prototypes at lightning fast speeds, allowing them to alter designs and develop new, experimental parts virtually overnight. As far as GE is concerned, the factory of the future is here, and it was made possible because of 3D printing.